Each year at the ACFE Global Fraud Conference, the ACFE recognizes local chapters that have gone above and beyond their missions with two awards: Chapter of the Year and Chapter Website of the Year. This year’s awards were presented to the Middle Tennessee Chapter and Germany Chapter, respectively. 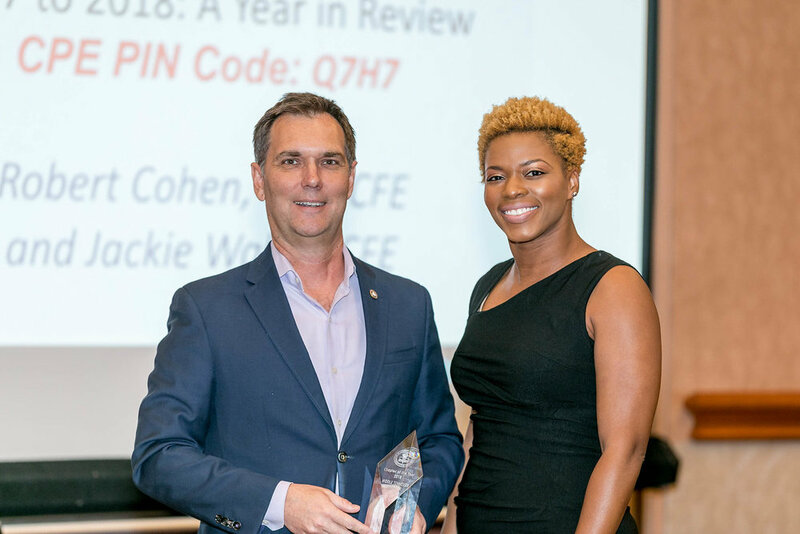 ACFE President Bruce Dorris presenting the Chapter of the Year award to Kesha Thomas, CFE, from the ACFE Middle Tennessee Chapter. The 2018 Chapter of the Year was accepted by Kesha Thomas, president of the Middle Tennessee Chapter. Now in its 26th year, the Middle Tennessee Chapter continues to serve its members and advance the mission of the ACFE, which is to reduce fraud worldwide. The chapter offered numerous networking opportunities to their members and other professionals throughout the year, provided scholarships and discounted memberships to students, and provided anti-fraud resources to the community through their website and social media accounts. In 2017, the chapter held seven one-hour monthly luncheon events, hosted their 21st Annual Fraud Conference worth 16 CPE, and held a member benefit day which offered another 8 CPE at no charge to their chapter members. The chapter also was the host city to the 28th Annual ACFE Global Fraud Conference last year in Nashville. While at the conference, they helped raise more than $30,000 for the Ritchie-Jennings Memorial Scholarship Program by organizing the Charlie Daniels Band to perform for conference attendees and guests. In addition to helping raise funds for the ACFE Foundation, the chapter offers scholarships each year to students in the fraud-related field. They offer six scholarships totaling $6,500 to students in the middle Tennessee area. The chapter also helped their community by donating $450 to a local food bank which used those funds to provide nearly 2,000 meals to those suffering from hunger. Along with all of the other benefits, the chapter offers an all-expense paid trip to the ACFE Global Fraud Conference each year to the chapter member who obtains the most points from participating in chapter-related activities. 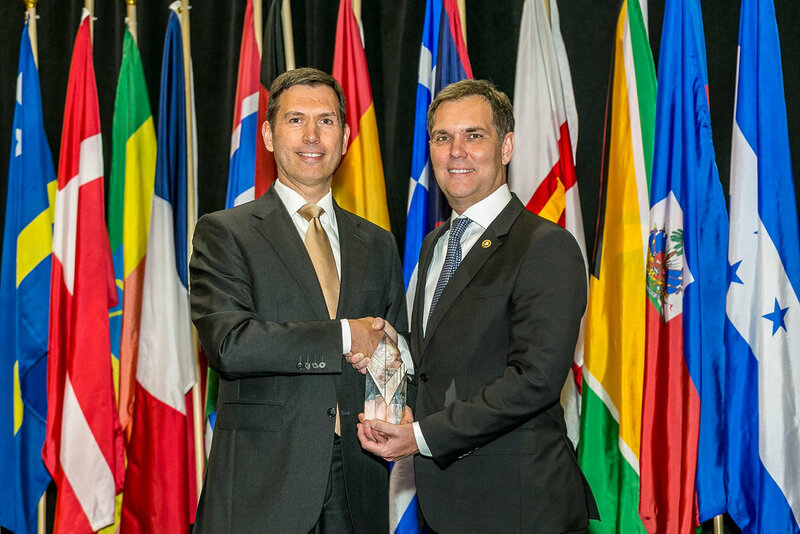 ACFE President Bruce Dorris presenting the Chapter Website of the Year award to Jens Baumrucker, from the ACFE Germany Chapter. The 2018 Chapter Website of the Year was accepted by Jens Baumrucker, webmaster for the Germany Chapter. The Germany Chapter’s website recently went through a significant redesign. Along with displaying local upcoming events put on by the chapter, they also heavily promote the CFE Exam Review Courses taught by local Authorised Trainers. The site is extremely easy to navigate. It also has a publication, called Fraudster News, which provides members with a summary of fraud-related articles from the previous weeks. The site is updated every other week with new articles. They have a job board for their chapter members and a library with nearly 100 documents members can use to help advance their careers. Both winners were selected by the Chapter Leaders Committee and chosen from among nominations submitted between January and March earlier this year. Congratulations to both winners!